Of the three books under review, Shoshana Zuboff’s is easily the most distinctive. In The Age of Surveillance Capitalism: The Fight for a Human Future at the New Frontier of Power, Zuboff sets herself an ambitious task: demonstrating that the major internet platforms — Google and Facebook especially — represent a new, more pernicious form of capitalism. She mostly succeeds. Though Zuboff was a long-time faculty member at Harvard Business School, she is, first and foremost, a social scientist — which means she thinks both systemically and historically. 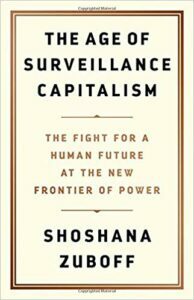 We should not be surprised, therefore, that early in The Age of Surveillance Capitalism she asks us to consider a provocative historical precedent. Once the Europeans had discharged their duty to inform, the way was clear for pillage and enslavement . . . In this world-shattering confrontation with the unprecedented, the native people were summoned, advised, and forewarned in a language they could not fathom to surrender without resistance in recognition of authorities they could not conceive. The answer is as obvious to us as to Zuboff: in the Spanish conquistadors, the Tainos had encountered something entirely without precedent. As a result, they were unprepared and ill-equipped to resist. She believes we have been equally unprepared to apprehend and oppose the dangers of the internet platforms that have brought us surveillance capitalism. But that is hardly Zuboff’s only reason for turning our attention to the Tainos. She believes the core dynamic of conquest for the conquistadors and for the internet titans is similar. The conquistadors simply showed up and declared to the Tainos that, henceforth, they would be considered either infidels fit for slaughter or vassals fit for slavery. Their days of freedom and autonomy were over. Page grasped that human experience could be Google’s virgin wood, that it could be extracted at no extra cost online and at very low cost out in the real world, where “sensors are really cheap.” Once extracted, it is rendered as behavioral data, producing a surplus that forms the basis of a wholly new class of market exchange. Surveillance capitalism originates in this act of digital dispossession (emphasis added). In fact, (much of) the first half of Zuboff’s book, is her attempt to help us “recognize the ‘original sin of simple robbery’ at the heart of this new capitalism” — and be suitably outraged. surveillance capitalists are now locked in a cycle of continuous intensification of the means of behavioral modification. Surveillance capitalists’ interests have shifted from using automated machine processes to know about your behavior to using machine processes to shape your behavior according to their interests. In other words, this decade-and-a-half trajectory has taken us from automating information flows about you to automating you (emphasis added). That quote highlights both the strength and the weakness of The Age of Surveillance Capitalism. To her credit, Zubott has an acute sense of the dangers posed by internet platforms. She also has a decided tendency to overreach. She reminds us, in fact, that social scientists and the conquistadors share something in common — a belief that one can declare reality to be whatever one envisions. Zuboff’s readers must decide whether (some) of her declarations are of a dystopia more imagined than real.